Looks like you don't have to say no to all the carbs! For years we've been hearing that cutting carbs should be a cornerstone of most diets when you're trying to lose weight…but not so fast! Turns out, there are some carbs you're going to want to keep around. A member of the cereal grains, barley may have the ability to increase the levels of a hormone tied to satiety. A study from Sweden discovered that boiled barley kernels can change bacteria in your gut, which in turn can rev up the metabolism. Researchers also found that this fiber-rich starch was shown to "decrease hunger sensations." You can tie this nut-like food into your diet by using it in baked goods and breakfast items (like pancakes and waffles) or tossing it in salads and soups. Oatmeal has a reputation for being a warm, snuggly comfort food—which means when you start dieting and cutting out carbs, it's the first to go. But registered dietician and Los Angeles-based entertainment nutritionist Shira Lenchewski, M.S., says she's a huge advocate of oatmeal. She explains that its complex carbs (aka the "good" carbs) not only fill you up, but they'll make you less likely to go overboard at lunch (or approach the vending machine before noon). Just make sure to steer clear of brands with added sweeteners and flavorings—instead, Lenchewski recommends using cinnamon, almond butter, or a teaspoon of coconut sugar for extra flavor. Who needs potato chips? OK, so maybe we need potato chips, but having a go-to substitute should help wean our addiction. 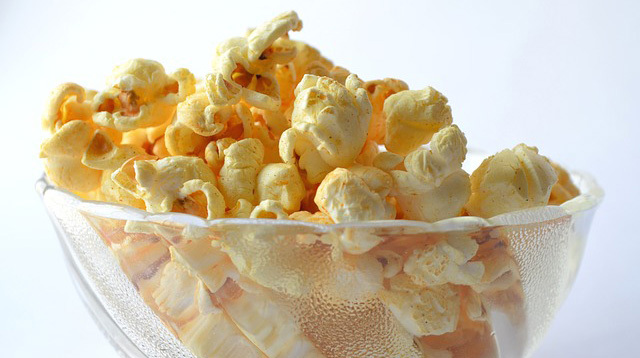 In a study that compared the short-term satiety of these two popular snacks, food and health researchers from around the United States found that most volunteers reportedly felt less hunger and more satisfaction after eating popcorn. If you're more satisfied, odds are you'll be eating less, ergo, taking in less calories. Since this powerhouse grain contains nearly twice as much fiber as other grains, that fiber gets released much slower into the bloodstream, keeping blood sugar levels balanced, which in turn increases your metabolism. Also, compared to other modified gluten-free foods, quinoa (which is naturally gluten-free) has been shown to aid in weight loss since it produces lower free fatty acid levels (which is linked to insulin resistance). For a satisfying crunch, chickpeas should be toward the top of your snack list, because they're loaded with fiber and protein. A 2014 study states that eating pulses—a specific family of legumes that includes chickpeas, beans, peas, and lentils—can prevent overeating and help keep weight regulated. Roast some soaked chickpeas at 375 degrees for 40 minutes, and add about three tablespoons oil and your favorite spices for a taste-bud-customized, crunchy snack, says Lenchewski. Keep a couple of these orange root vegetables in your pantry for when you want to satisfy your carb craving and sweet tooth (OK—so it's no candy bar, but c'mon). A medium-size sweet potato contains aout 27 grains of carbs, but they've been shown to increase levels of adiponectin, a hormone that regulates blood sugar, and in turn helps encourage a faster metabolism. They're also fat-free and have fewer calories and sodium thatn white potatoes. It looks like Cheerios had it right the whole time! Whole-grain cereals are naturally low in fat and high in fiber, and according to researchers can decrease the size of your waistline. One study showed that men and women who consumed more whole-grain cereals had more lower body mass index (BMI) and less adominal fat. "This study takes the evidence a step further and shows that people who eat more whole-grain foods have lower abdominal fat," says lead researcher Nicola McKeown. While this dairy product may not seem like the typical carb, the naturally occurring milk sugars (aka simple carbs) may scare people away, but they shouldn't—because this creamy snack can help you take off those unwanted extra pounds. Research has found that consuming probiotic yogurt (along with a low-calorie diet) can reduce your body mass index (BMI) and body fat percentage. Lenchewski explains that low-fat Greek yogurt provides a powerful comination of natural sugar and satiating fat, along with packing a major protein punch. "And the healthy fats and protein can prevent blood sugar levels from dropping, which will help keep sugar cravings at bay."